A pump sprayer quickly and effectively applies fence stain. If you use it properly, you will get good results. Before painting the fence, you need to first prepare the fence to help the paint adhere well. The surface of the fence must be clean, dry and free of contaminants, such as dust, dirt, mildew and oil. You also need to protect the surrounding surfaces from paint drips to prevent any damage to plants or flooring. A pump sprayer applies even coats of fence paint. Place cardboard spray shields behind and under the wood to keep chemicals from splattering onto other surfaces. Hardware and home improvement stores usually sell these spray shields. Apply a cleaning solution to your fence. The type of cleaning solution to use depends on your fence. For example, use a wood cleaner for a wood fence or use a mold remover if you have mold problems. 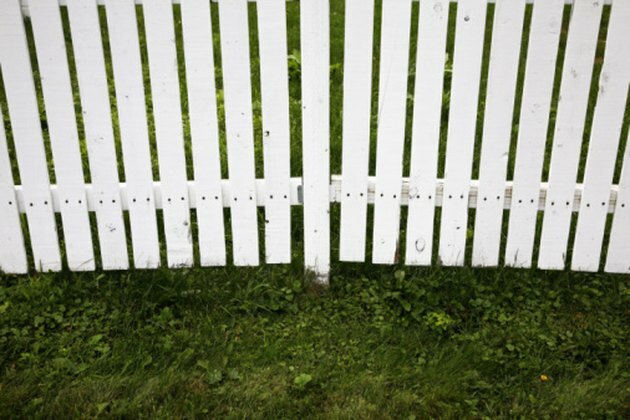 Use a brush to scrub the fence surfaces and rinse with water. Let the fence dry. Mix the paint thoroughly to ensure an even coating. If possible, get your local hardware or home improvement store to mix the paint for you using a mechanical mixer. Fit a disposable paint filter over the nozzle of the pump sprayer to prevent clogging. Pour the fence stain into the sprayer and affix the attachments to the pump sprayer. Pressurize the sprayer by pushing and pulling the handle at the top of the pump sprayer tank. Point the nozzle of the pump sprayer at the fence and apply the paint to the fence evenly. Can I Spray Vegetables With Liquid Fence?